In January 2016, Mónica Ponce de León began her tenure as Dean of the School of Architecture. 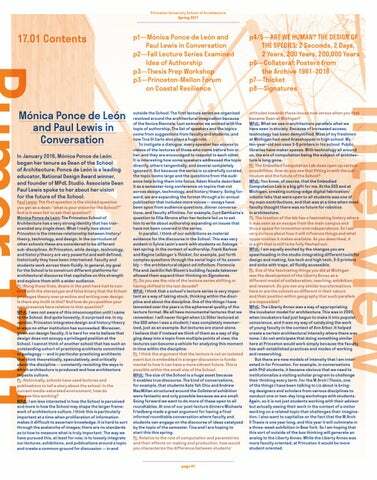 Ponce de León is a leading educator, National Design Award winner, and founder of MPdL Studio. Associate Dean Paul Lewis spoke to her about her vision for the future of the School. attitudes towards these issues now versus when you first became Dean at Michigan? MPdL: What we see in architecture parallels what we have seen in society. Because of increased access, technology has been demystified. Most of my freshmen at Michigan had used Grasshopper in high school. My ten-year-old son uses 3-D printers in his school. Public libraries have maker spaces. With technology all around us, the era of computation being the subject of architecture is long gone. PL: The Embodied Computation Lab does open up certain possibilities. How do you see that fitting in with the curriculum and the future of the School? MPdL: You know, of course, that the Embodied Computation Lab is a big gift for me. At the GSD and at Michigan, creating cutting-edge digital fabrication/ robotic labs that were open to all students was one of my main contributions, and that was at a time when most faculty thought there was no future for robotics in architecture. PL: The location of the lab has a fascinating history where it was seen as an escape from the main campus and thus a space for innovation and independence. So I am very curious about how it will influence things and what opportunities it makes available. As you described, it is a gift that is still to be fully fleshed out. MPdL: I am equally excited by the changes you are spearheading in the studio integrating different tools for design and making, low tech and high tech, 3-D printers and sinks with traps, all fluidly accessible. PL: One of the fascinating things you did at Michigan was the development of the Liberty Annex as a different model of collaboration, teaching, exhibition, and research. Do you see any similar transformations here or are the schools so different in their nature and their position within geography that such parallels are impossible? MPdL: The Liberty Annex was a way of appropriating the incubator model for architecture. This was in 2009, when incubators had just begun to make it into popular conscience, and it was my way of catalyzing the work of young faculty in the context of Ann Arbor. It helped create a certain architectural intensity where there was none. I do not anticipate that doing something similar here at Princeton would work simply because the faculty has well-established practices and modes of working and researching. But there are new models of intensity that I am interested in for Princeton. For example, in conversations with PhD students, it became obvious that we need to institutionalize a visiting scholar program to challenge their thinking every term. For the M.Arch I Thesis, one of the things I have been talking to Liz about is bringing designers and scholars from various disciplines to conduct one or two-day long workshops with students. Again, so it is not just students working with their advisor but actually seeing their work in the context of a visitor working on a related topic that challenges their imagination. I also want to capitalize on the fact that the M.Arch II Thesis is one year long, and this year it will culminate in a three-week exhibition in New York. So I am hoping that this sort of outside of the box thinking will generate an analog to the Liberty Annex. While the Liberty Annex was more faculty oriented, at Princeton it would be more student oriented. of a just compensation of the various inputs to a project, is becoming central in the digital age. Beyond ownership, this transformation leads to a different understanding of architectural authorship. 11/07: The Kassler Lecture, W.I.P #183 Thom Mayne, FAIA (Morphosis Architects) “Architecture is a way of seeing, thinking and questioning our world and our place in it. It requires a natural inquisitiveness, an openness in our observations, and a will to act in affirmation. It affects us directly and profoundly — it has the potential to impact behavior and the quality of everyday life.” —Thom Mayne Framing his lecture against this backdrop, Thom traced the development of some of the major themes and interests that have defined Morphosis over forty years of practice, from their emergence in early Morphosis projects and explorations, to their realization in the diverse scales and project types that make up the firm’s current work. In each project, an examination of the built form revealed how the design process begins with and is shaped by the specific questions we choose to acknowledge in our own investigation. 10/6: Author After Author Ellie Abrons (Principal, EADO; Assistant Professor of Architecture, Taubman College of Architecture and Urban Planning, University of Michigan) Ellie Abrons presented related forms of authorship in her work and collaborations. The first focused on material manipulation that re-authors qualities to produce new images and perceptions of materiality. The second adopted a postdigital sensibility that suggests new forms of creativity and authorship. This work removed distinctions between the original and the copy, often blurring between digital and physical realms and breaking down the difference between the “real” thing and its representation. 10/13: The Architecture of Creative Miscegenation Marshall Brown (Principal, Marshall Brown Projects; Associate Professor, Illinois Institute of Technology College of Architecture) Marshall Brown used appropriation and collage to actively embrace the possibilities of influence in architecture. The inherited material of history and culture were carefully dismantled, realigned, and reassembled to create new forms and spaces. Unlike earlier experiments that emphasized disjunction, this work created alignments between disparate architectural conditions — not to impose order and identity, but rather to assert architecture as the formation of new alignments and new legibilities. 12/01: Signatures Florencia Pita and Jackilin Hah Bloom (Pita: Partner, Pita & Bloom; Design Faculty and Graduate Thesis Coordinator, SCI-Arc; Bloom: Partner, Pita & Bloom; Design Faculty, SCI-Arc) The question of authorship in architecture has always been a loaded one. As a fairly new practice, and one that considers the uniqueness of each project they take on, the theme of “authorship” gave Pita & Bloom the opportunity to evaluate their work as a whole and dissect identifiable qualities or similar approaches they took on each project. In doing so, the projects of Pita & Bloom to date can be defined by the repetition of rehearsed gestures, contours, and geometries — a kind of collection of profiles and curves that produce unexpected forms. that they might not have the opportunity to do once they leave school. Each emphasized the tricky relationship between research and application, between Lynn’s industrial partnerships and Martin’s work with MoMA and Columbia University’s Buell Center, particularly in reaching certain audiences and policymakers, and engaging the real through different scales of operation. The second workshop illustrated these approaches with two recent graduates presenting their thesis projects. Kai Franz, who hacked a school’s obsolete plotter to create a sculpture printer, used his semester to work on issues of representation and fabrication in the context of digital resolution. He used the work started at Princeton to build a practice and as an assistant professor at RISD. Francois Leininger used his thesis to study presidential libraries both as a typology and symbol of political power, traveling around the country with a Butler Fellowship to visit the thirteen already built, in order to propose an approach for the Obama Presidential Library. He used institutional resources to investigate a topical political issue where architecture could actively engage, and eventually published several international articles on the research. As evident in the walls of this building, the project of thesis is both consequential and hardly straightforward. These and other internal workshops focused on issues of “what matters,” “what is thesis worthy,” and other questions to help build and reveal perspectives on the kind of work students might engage, and in particular, on the role the School and teaching should play as a launching ground for these inquiries. 2012). Devienne is completing a book titled Beaches in the City: A Social and Environmental History of Los Angeles’s Shoreline. The Princeton-Mellon Initiative recently completed its sixth semester at the School of Architecture. Established in Spring 2014 thanks to a grant from the Andrew W. Mellon Foundation, the initiative sponsors team-taught courses, studio travel, events, and a fellowship program aimed at bringing together scholars and students who study cities and the built environment. At the core of the initiative is the Princeton-Mellon Forum, a series of interdisciplinary conversations on emerging research. The 3rd Istanbul Design Biennial was co-curated by Beatriz Colomina, Professor at the School of Architecture and Co-Director of the Media and Modernity Program at Princeton University, and Mark Wigley, Professor and Dean Emeritus at the Graduate School of Architecture, Planning and Preservation at Columbia University. The main exhibition took place between October 22 and November 20, 2016 and was attended by more than 120,000 visitors. Titled ARE WE HUMAN? THE DESIGN OF THE SPECIES: 2 seconds, 2 days, 2 years, 200 years, 200,000 years, the biennial explored the intimate relationship between the concepts of “design” and “human.” The exhibition presented more than 70 projects from five continents and several islands by designers, architects, artists, historians, archaeologists, and scientists in five main venues: Galata Greek Primary School, Studio-X Istanbul and Depo in Karaköy, Alt Art Space in Bomonti, and Istanbul Archaeological Museums in Sultanahmet. SUPERHUMANITY, a major collaborative project with E-Flux, commissioned more than 50 writers to address the biennial theme and an international open call yielded 150 videos that were presented in the exhibition. Princeton faculty involved in the biennial included Beatriz Colomina, Lucia Allais, Eyal Weizman, Spyros Papapetros, Axel Kilian, Andrés Jacque, Liz Diller, Michael Meredith, Sebastian Seung, Paulo Tavares, and others. Student involvement centered on two history and theory seminars on design led by Professor Colomina in the School of Architecture. During the summer of 2016, a student team from the School of Architecture and the Department of Art and Archaeology at Princeton also assembled with a team from Columbia University to develop six major curatorial interventions in the exhibition: The Unstable Body, Are We Normal?, Enclosed by Mirrors, Homo cellular, Design in 2 Seconds, and Design has Gone Viral. Princeton students involved in these projects included Ivan-Nicholas Cisneros, Diana Cristóbal, Nazli Ercan, Jessica H. Ngan, Mercedes Peralta, Bart-Jan Polman, and Weiwei Zhang. Princeton School of Architecture alumni who contributed collaborative and independent research projects were Urtzi Grau on the construction of the Indo-Pacific region, Lydia Kallipoliti on the history of the engineered man, Alfredo Thiermann on the limits of human design in Antarctica, and Igor Bragado and Miles Gertler on the urbanism of cosmetic surgery in Seoul. Recent Princeton-Mellon fellow Pedro Ignacio Alonso presented a project on the archeology of the American and Soviet space programs in South America. have taught architecture or graphic design: Diana Agrest, Aaron Marcus, and Tony Vidler. The second conversation focused on contemporary graphic culture and its relation to architectural design and production, featuring professors Stan Allen and Michael Meredith as well as Visual Studies Department Professor David Reinfurt. Kate Yeh Chiu and Andrew MacMillan curated Collateral: Posters from the Archive 1961–2016 under the direction of Tina di Carlo and moderated the evening of conversation. CC: Installations have been a consistent part of your practice. From your recent Serpentine Pavilion (2016), Hyperbolic Loom that we made in Marrakech in 2012, to the field of machined metal tubes and form-changing wall you presented at the Venice Biennale, what would you say is the relationship between these projects and your buildings? You’ve said that temporary installations have allowed you to test out ideas that find themselves in buildings later on. Does this influence happen the other way as well? Do building ideas find themselves in your installations? BL: Yes it’s true that installation work is situated exactly between open-ended experimental research, a kind of playing or spielraum, and building projects. An installation is a reaction to the circumstances and questions put in place by a curator (exhibitions), economies of materials and budgets, response to the brief, context etc., yet are focused and unburdened by the constraints of building projects (permanence, program, utility, etc.). So in this way the installation work is an evolving archive of possibilities that tend to have a stronger offering for building projects rather than the other way around. An example of the opposite path would be our Summer House for the Serpentine Galleries where the looping structure is a re-scaling and more idiosyncratic version of a huge cellular roof we designed for a “Museum to the Future” for Mercedes Benz. On the other hand, that roof itself was informed by experimental work: the weaving of plywood into a “loop pavilion.” This is only to say different work areas are parallel but intertwined offering currency to each other. We see these as an evolving and pro­a ctive archive. On December 1, 2016, Florencia Pita and Jackilin Hah Bloom, founders of the Los Angeles-based architectural design collaborative Pita & Bloom, opened Signatures at the Princeton University School of Architecture. 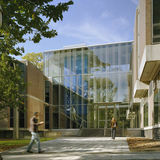 Signatures is a decorative appliqué to ARO’s glass link between the two original School of Architecture buildings by Fisher, Nes, Campbell and Partners. On the exterior, curvilinear outlines generate three-dimensional forms that are column-like but not of a particular style. A collage of textures sit in for an interior condition, where concrete pipes, an Olivetti typewriter, a violet, and a Max Ernst etching are set behind columns. On the interior, residual curves are expressed as mullions that align to the vertical rhythm of the existing glass façade. Two- and three-dimensional forms play between front and back, night and day, coalescing architectural imprints and challenging the visual stability of the image. Pita & Bloom was formed in 2010 by Florencia Pita and Jackilin Hah Bloom. Pita & Bloom utilize vivid color and reconfigured ornamentation with unexpected forms to challenge traditional material conventions. The work of Pita & Bloom includes competition proposals for worldclass buildings such as the Guggenheim Museum in Helsinki, Finland, a housing ideas project in Maribor, Slovenia, and an urban park scheme in San Francisco, California. In January of 2014, Pita & Bloom were called “two female visionaries” in Architecture Magazine’s Next Progressives and were one of five finalists of the prestigious MoMA PS1 YAP competition. Florencia Pita and Jackilin Hah Bloom teach design studios at the Southern California Institute of Architecture.